This authoritative resource covers all aspects of atmospheric sciences - including both theory and applications. Nearly 350 articles and over 1,900 figures and photographs are presented, many in full-color. The Encyclopedia is an ideal resource for academia, government, and industry in the fields of atmospheric, ocean, and environmental sciences. It is written at a level that allows undergraduate students to understand the material, while providing active researchers with the latest information in the field. The Encyclopedia of Atmospheric Sciences has been developed alongside the award-winning Encyclopedia of Ocean Sciences. Together these references provide readers with a comprehensive resource and a link between these two fields. Also available online on ScienceDirect. 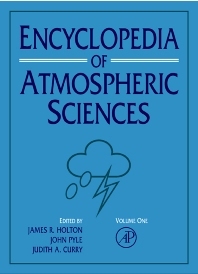 @qu:This authoritative resource covers all aspects of atmospheric sciences... Nearly 350 articles--from acoustic waves to the World Climate Research Program...""
@qu:""...has an excellent collection of articles across a wide range of topics and would make a terrific addition to any reference collection. This resource is highly recommended for collections supporting research in the atmospheric sciences and likewise suitable for physics, chemistry, biology and environmental science undergraduate and research programs."" @qu:""I greatly welcome this unique Encyclopedia of six volumes containing 340 contributions, each of approximately 4000 words, on all major aspects of atmospheric science and cognate subjects such as oceanography and hydrology, and that range from Acid Rain to the World Climate Research Programme. ... The six volumes promise to be the most comprehensive and widely consulted publication in the atmospheric sciences for years to come. Every scientist engaged in post-graduate teaching and research in the subject will need access to a copy. The publishers, the editors, the advisory board, and the authors are to be congratulated on providing a most valuable service to their scientific colleagues worldwide."" @source:From the Foreword by Sir John Mason, F.R.S., Imperial College, London, U.K.
@qu: ""We wholeheartedly recommend this much needed and long awaited atmospheric science encyclopedia as a rare and excellent addition to reference shelves in private collections, universities, private and national laboratories, individual scientists, scientific writers, and undergraduate and graduate students of atmospheric, oceanic and environmental sciences. Its comprehensiveness will lead us to frequent consultation and to refer it to both our students and colleagues, time and time again.""